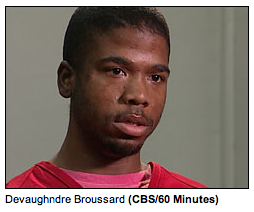 OAKLAND — Admitted double killer Devaughndre Broussard told a relative shortly after his 2007 arrest that someone else “made the call” to kill journalist Chauncey Bailey, according to a recording of a jail telephone call played in court Monday. Asked by prosecutor Melissa Krum who that person was, Broussard said, “Yusuf Bey IV,” his leader at the former Your Black Muslim Bakery. Broussard previously testified Bey IV ordered him to kill Bailey to stop the Oakland Post editor from writing a story about the bakery’s finances. Broussard did not identify Bey IV on the jail phone call as the person who ordered the Bailey hit, however. The recording captured an Aug. 4, 2007, call Broussard made to his uncle, who was not identified in court, and jurors listened as the then 19-year-old sobbed his way through pleas for help as he tried to explain why he was in jail on a murder charge. As Broussard finished his testimony after six days on the stand, Krum used the phone recording in an attempt to rebuild Broussard’s credibility after a blistering cross examination of her star witness by attorneys for Bey IV and his co-defendant, Antoine Mackey. Broussard admitted under cross examination to lying numerous times about the killing. Broussard, now 23, has pleaded guilty to killing Bailey and another man, Odell Roberson, in summer 2007 and said Bey IV ordered both slayings and Mackey helped him carry them out. He has also said Bey IV and Mackey, both 25, bragged about killing another man, Michael Wills. Bey IV and Mackey have pleaded not guilty. They face life in prison without the possibility of parole if they are convicted. Broussard will receive a 25-year sentence for cooperating with prosecutors. Krum played two other phone calls Broussard made shortly after his arrest to another bakery follower named Kahlil Raheem. In one of them, they discussed who from the bakery was in jail and who had been released. “Ali’s out of jail,” Broussard, using Mackey’s Muslim name. He said he was surprised by that because police had found a sawed-off shotgun in Mackey’s bedroom. “Was he involved in that (stuff) or something?” Raheem asked Broussard. Broussard testified that he understood the question to be about Mackey. “I can’t speak to that,” Broussard replied. In another call, Raheem urged Broussard to “tell the truth” regardless of whether that meant naming others. “They telling on you,” Raheem said, a reference to Bey IV’s statement to police, in which he told officers that Broussard had confided in him about killing the journalist. In that statement, Bey IV said Broussard acted alone. Last week, Broussard admitted he couldn’t remember where he was when Bey IV ordered the Roberson hit and said the word kill wasn’t used. Under questioning from Krum, Broussard said such plain language was never used when bakery followers talked about crimes. Krum asked Broussard what words they used for killings. “Smack. Whack. Knock down. Play it out. Air it out,” Broussard replied. “What were the precise words he used to tell you to kill Odell Roberson?” Krum asked. “Take ’em out,” Broussard replied. During another round of questioning from Bey IV’s attorney, Gene Peretti, on Monday, Broussard said had once planned to kill Bey IV as retribution for telling police he killed Bailey. “Would you kill him right now?” Peritti asked as Bey IV, in a dark pinstriped suit and bow tie, sat watching. “Nah. No reason to now,” Broussard answered. “I got my get-backs. He told on me and now I am telling on him,” he said and broke into laughter. Earlier in the day, a defense attorney asked Reardon to ban jurors from reading newspapers or using the Internet for the duration of the trial after the Bay Area News Group reported that a journalist had received a death threat while reporting a story related to the bakery. Gary Sirbu, who is representing Mackey, made the request as trial resumed. Articles about the threat were published Saturday on the front page of Bay Area News Group publications, including the Oakland Tribune. Judge Thomas Reardon asked jurors if they had read any news stories over the weekend about the telephone threat made to reporter Josh Richman. By a show of hands, jurors indicated they had not read the articles. Reardon denied Sirbu’s request, saying he did not want to make such an order. But the judge again cautioned jurors to avoid any news coverage about the case or anything related to Your Black Muslim Bakery. The trial is expected to continue through June. Oakland Police are investigating the threat. Contact investigative reporter Thomas Peele at tpeele@bayareanewsgroup.com. Follow him at Twitter.com/thomas_peele.